Upper left margin: This image is of the king of Egypt who saw in a dream that seven lean kine devoured seven fat kine and then he saw that seven weak stalks of wheat destroyed seven strong stalks; these occurrences were a portent of the seven-year famine in Egypt. Upper right margin: When the king awoke from that sleep, he summoned interpreters and learned men and told them of his dream. The interpreters were unable to interpret that dream and it remained unsolved. Lower left margin: Afterwards they told the king of Egypt that there is someone sitting in the prison who knows the interpretation of this dream. They fetched Joseph and His Excellence Joseph interpreted each of the seven as signs of the seven-year famine [to come to] Egypt. Lower right margin: And since Joseph, peace be upon him, had related the interpretation of the king’s dream, the king gave his ring to Joseph and exalted Joseph; they placed him upon a chariot and the court grandees rose to show [their] respect to Joseph. Upper left margin, furthest left: The king [Pharaoh] dreams about the fat and lean cattle. Upper right margin, furthest right: The king seeks out dream interpreters to interpret his dream. Lower left margin, furthest left: The ruler of Egypt is informed that there is a person in [his] prison who knows how to interpret dreams well. 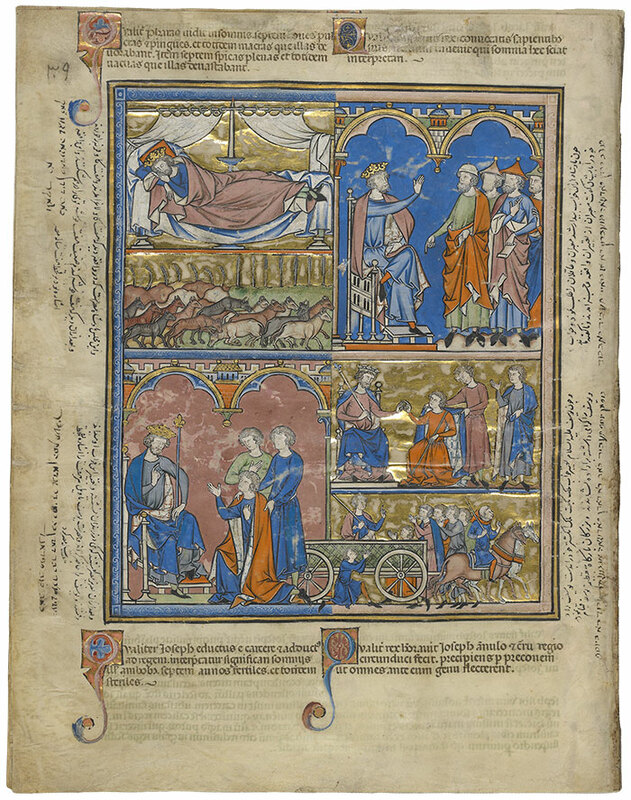 Lower right margin, furthest right: Joseph interprets the king’s dream and the king bestows his ring upon Joseph.